4.1 out of 5 based on 141 bloggers and 20 commenters. 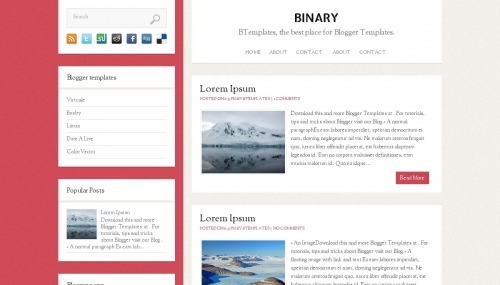 Binary is a free blogger template adapted from WordPress with 2 columns, left sidebar, social bookmarking icons, posts thumbnails, girly looking and vintage style. How do you edit the social media buttons? The html won’t show. How do you edit the social media buttons? Necesito ayuda como ago para que las descripción de las entradas que tengos me salgan como en la plantilla original y no em salga solo una descripción y me toque darle sigueinte entrad apara ver la otra descrpción. How I can show the navbar? Eu até gostei do template, é muito bonito, mas como faz para mudar as pessoa que vem nas redes sociais e colocar as minhas? How can I get this template to show the post date in addition to the time? How can I get this template to show the blog post date in addition to the time? This is the perfect template for my blog. Thank you! Love this template and have installed it – but in the preview, you show pinterest as an icon on the individual blog posts – but that doesn’t show up once I have installed it. How do I fix that. great job… like it ..
how do I shift sidebar to right, and main to left? Good.Actually,I’ve recently created a blog and wanted a nice template for it that’s why I came here. How i change the column color ?